Carry around your favorite self-care items – or anything else you need – with this stylish canvas AFSP tote bag! 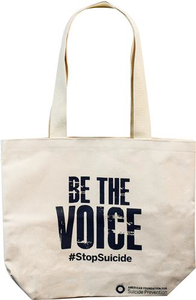 White with the message “Be the Voice,” “#StopSuicide” in dark gray, it’s the perfect way to spread hope while you’re on-the-go. 16” W x 14” H x 4.5” D.